A touch of Old Hollywood reserved for the high-fashion starlet. Stealing the show with its glamorous good looks and upscale attitude, this chest of drawers is red carpet style made highly affordable. 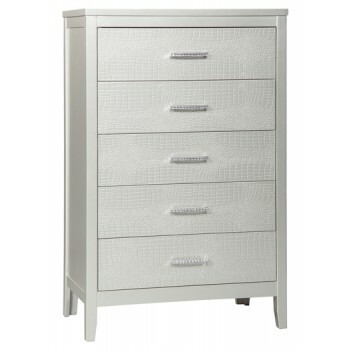 Distinctive elements include a silvertone metallic finish, chrome-tone pulls with encrusted faux crystals and faux shagreen drawer fronts for a rich textural twist.